The most popular article in the MGS journal, The Mediterranean Garden, has proved to be one about pruning olive trees. It seems that gardening in a Mediterranean country goes hand in hand with growing olives – from planting a new grove to tackling one or two neglected trees. So here in their entirety are the three articles about olive cultivation which have appeared in TMG in the past followed by lecture notes from an olive expert who gave a workshop at the 2007 AGM Symposium. It is difficult to find a medium path between these two extremes. With olives there is no doubt that modern processing with centrifuge machines has improved the quality of olive oil enormously for the industry as a whole. The old stone wheels and hydraulic presses were slow – so slow that the olives accumulated during harvest and were often not pressed for months. At Foligno there is a magnificent old frantoio that has a huge loft with a wooden floor impregnated with olive oil. The olives were stored there as much as a metre deep. The windows were left wide open to cool the olives which were fermenting or going mouldy or both. The loft is now empty as the modern centrifuge machines can handle the crop as it comes in. I have to admit that our own treatment of the olives was not very good 25 years ago. We took our olives to the frantoio with a neighbour and he waited until the end of the harvest. This meant that the olives were stored in a shed for ten days or two weeks. That is a lot better than the two months of storage one hundred years earlier and they were in shallow boxes not a metre deep in a loft. Now our neighbour works in with us and I try to take the olives to the frantoio everyday or wait no more than 36 hours. Of course this dodges the question of whether the modern machines are better or worse than the stone wheels and presses if the olives are processed fresh. There are vocal protagonists on both sides. Extracting the olive oil consists of essentially three processes. After the olives have been cleaned they are crushed. This can be done with the stone wheel or a hammer mill. The crushing process is often misunderstood as it involves not simply the extraction of the juice but a total break down of the cells. The juice of the olive is a bitter watery liquid and the oil is inside the cells. These are smashed by the hammer mill or pounded by the stone wheel. The arguments seem to be that the stone wheel results in more oxidation of the oil with some impact on the colour. On the other hand the hammer mill not only smashes the cells but also emulsifies the oil. It cannot be extracted directly and has to be stirred so that the emulsion coagulates into larger droplets. After that the oil and juice (aqua vegetale) can be extracted with a centrifuge or a press. The centrifuges suffered in the past from stripping out too much flavour. It was necessary to add water to the paste to make it run through the centrifuge and the added water took some of the flavour of the oil with it. The more modern centrifuges have overcome this problem by recycling some of the juice of the olive instead of using water. Our local frantoio has one of these newer centrifuges fitted and we are happy with the quality of the oil. One of the traditions that is completely immutable is that the frantoio owner is always cheating the poor olive grower. If the resa (percentage of oil) is low or there is anything else wrong it is always the fault of the owner. I used to argue that it was not worth the owner risking his reputation for such a tiny amount of oil but soon found that I could not prevail against such a long-standing tradition. The oil that was produced from the olives stored for long periods in the loft was very bad. The technical measure of the breakdown of the olive is the acidity of the oil. The acidity starts to rise rapidly as soon as the olives leave the tree. This is why recovering the olives from the ground, even if it was economical, is not a good idea. High acidity is more complex than that but fresh olives at the frantoio are a good starting point for low acidity. Again, processing came to the rescue as the high acidity of these oils could be reduced by refining the oil and neutralising the acidity. I have read some old accounts of the oil in Umbria in the early 20th century that said it needed more refining to improve the quality. We have come a long way since then and now this refined oil is the lowest grade and we have all become aficionados of Extravergine Olive Oil. The low-grade refined oil is called Olive Oil with capitals, which is somewhat confusing as olive oil is the generic name for all the oil from the olive. While refining certainly improved the quality of these bad oils by reducing the acidity to low levels that are even less than Extravergine Olive Oil it unfortunately also removed all the flavour at the same time. Extravergine Olive Oil has an acidity of less than 0.8% and is produced without any chemicals – just heat and pressure. While there is considerable discussion about acidity it is really a technical minimum standard and it is the flavour of the oil that counts. The “heat” part of the extraction process is also controversial as some bottlers use the term “cold pressed” but everyone's definition of cold is different. There are legal maximums but most frantoio operate well below the legal limit. If “cold pressed” means no added heat then we would not have any oil at all in some seasons. While this year has been exceptionally warm during the harvest in other years we have had frost and even snow. I doubt whether oil could be extracted from these cold olives without some heating. The centrifuge process has made Extravergine Olive Oil commonplace but it has acquired myths. The most common is that one cannot fry with it. In fact olive oil is as good as almost all oils for frying and a lot better than butter. The reason one would not use Extravergine is that the high temperature boils off all the flavour. One should use a cheaper olive oil for frying. Yet one should not go to the other extreme and use the Extravergine only for cold dishes such as salad. In Italy a good Extravergine is a vital additional flavouring ingredient for many warm dishes from pasta to soup. 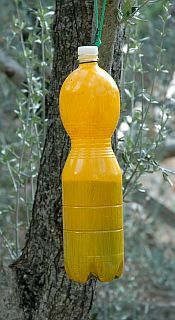 The colour of the olive oil can vary from a pale straw colour to an intense green. Professional tasters use blue tasting glasses to obscure the colour as the flavour is independent of the colour but obscuring the colour is an admission that the green colour does enhance our pleasure from the oil. When is comes to colour there is no question of any merit from the modern processing industry. The bottlers are well aware of the value of the green colour and have added artificial colouring to the oil. Perhaps the final disgrace is the colouring of the sansa oil to make it appear like a good Extravergine. September is the time of year when we become nervous about the olive fly. There have been reports of serious infestations in northern Umbria and elsewhere. Hopefully it will not be as serious as in 2014. At this stage it is not always easy to identify the first signs because the breathing hole of the grub is very small. If you cut open a sample of olives collected at random you can obtain a better idea of the extent of the attack. Later one sees the signs quite clearly (see photo) as a mouldy patch on the olive and a much larger hole where the grub or rather pupa has escaped. The infestation can be quite uneven, with some varieties of olive being more susceptible. Trees along a boundary with another grove where no control measures are being taken are more likely to be infested. There are many hundreds of thousands of abandoned olive trees in central Italy and they are a permanent source of infestation. I have checked our own groves and have found only a few olive fly-infested olives. Most of the trees are completely clean but a few have an infestation of as much as 5%. I put out the olive fly traps in June. That was before the flies laid their eggs on the tiny olives but I wanted to keep the fly population low from the beginning. I put a trap in every two or three trees and I have not found any relationship between the infested trees and the proximity to a trap. Some of the groves I manage are surrounded by abandoned trees but after a good crop last year they seem not to have a single olive on them this year. This biennial cropping is not unusual with trees that have not been pruned. In 2014 in spite of putting out traps I had a low level of infestation and decided to pick the olives about ten days early. The flies lay their eggs on the olives. The grubs hatch from the eggs and eat a considerable portion of the fruit but they also allow mould to enter. In 2014 many growers found that the oil they managed to salvage was so contaminated with mould that it was unusable. Early picking means that the mould has less time to grow. This brings me to the question of picking time. Here in Italy it is simple: the starting point is tradition. That may seem to be unscientific but research carried out at the Spoleto Olive Research Centre has confirmed that traditional picking times have considerable validity. Traditionally the objective was to obtain the maximum output of olive oil. The oil content of the olive increases week by week through September, October and the first half of November but then the olive tree shuts down as days are shorter and temperatures fall. Traditionally olive picking in our area started on St Catherine's Day – 25 November. This is very close to the time of maximum oil production. After that date the olives start to fall to the ground in increasing amounts. The olives on the ground are too expensive to pick up; moreover once they are on the ground their acidity rises and they will ruin the quantity of your oil. As more and more olives fall to the ground the yield of oil from the grove begins to decline. It seems strange that the percentage of oil in each fruit is still rising but the yield is falling. This is because the rise in the oil percentage is less than the loss from fruit on the ground. If you talk with the old timers at the frantoio (olive mill) they will tell you about the extremely high resa (percentage of oil) they used to get. This was due to late picking but it did not mean that they got any more oil from their groves. They had fewer olives but more oil in each olive. Nor did they save on the processing. We now pay a fee based on the weight of fresh olives at most of the olive mills but in the past the frantoio took a percentage of the oil. There was another reason for late picking. Before the era of the centrifuge olive mills were extremely slow. Olives accumulated and were stored in huge lofts where they often went mouldy. Processing often continued until January. With this bottleneck at the frantoio late picking was sensible. The colour of the olive is not important. In our grove the Leccino is usually all coloured at picking time while the Frantoio is almost completely green. However outside Italy people do seem to be worried about the colour of the olive at the time of harvest. The most extreme example was some correspondence I had with a research centre in China. I asked the director whether they had a good crop. He replied that it had all fallen to the ground and they got nothing. He said this seemed to happen every year. I replied that the idea was to pick before they fell on to the ground and as the date of fruit fall was much the same each year that one should pick according to the date not the colour of the fruit. The growers' objectives have over the years changed and we now want good quality oil rather than just quantity. Early picking produces an oil with a stronger flavour. This is most important with varieties such as Leccino where the flavour fades quickly with late harvesting. Most of us have old groves that are mixed plantings and mixed in an almost random pattern so economically the only way to pick is to harvest all the olives together. New groves are usually planted with different varieties in separate rows. These still need to be mixed for the sake of good pollination. Most growers in our district now pick well before St Catherine's day. The resa is lower and so is the amount of oil per grove but the flavour is stronger and the acidity level lower. I start picking during the first week of November in a normal year but in 2014 I started on 20 October. I had a resa of 11% instead of our usual range of 14% to 16%. It was worth it as the oil was good and not contaminated with mouldy off-flavours. Some olives infested with the olive fly. At the bottom left two have been cut open and one can just distinguish the grub. Others show that the grub has pupated and dropped on to the ground. They all show the mould damage. A high percentage of olives such as these would produce oil that is of very poor quality indeed. Glyphosate – too much of a good thing? Glyphosate is a very effective herbicide. Many people know it under its original trade name of Roundup which is made by Monsanto. The patents have now expired and it is available in much cheaper generic forms with a variety of names. As a herbicide it combines many useful characteristics. Firstly it is a systemic herbicide. That means it enters the sap of the plant and kills it completely not just the leaves that have been sprayed. Unlike some other herbicides it is not residual. In the soil or when dead plants break down the soil bacteria break down the glyphosate so it does not linger in the soil and kill other crop plants. That story is now changing as we begin to understand the long-term effects of high application rates over a long period. Glyphosate applied to weeds in reasonable quantities is probably quite safe but unfortunately it is often applied to food crops and this has led to residues in food and moves to ban it altogether. At the moment there is a tussle between the European Parliament, the European Commission and the European Council of Ministers over the renewal of the licence for glyphosate which expired this year. It has been renewed for 18 months as a temporary measure but its future is on notice. Glyphosate can enter the food chain through Roundup Ready crops. These are genetically modified crosses between crops and the soil bacteria that destroy the glyphosate. The GM crop becomes resistant to the glyphosate because the crop has acquired the gene that breaks down the glyphosate. This turns the glyphosate into a selective herbicide. It kills the weeds but not the GM crop. That is the theory but the reality is different as the weeds are becoming resistant too. For example in Australia annual ryegrass is a serious weed in crops. It is easily killed with glyphosate but there are tens of millions of plants per hectare and as one or two seem to be resistant to glyphosate the resistant gene spreads and the whole population of annual ryegrass becomes resistant in six or seven years. The GM crop picks up the herbicide (not all of it is broken down) and glyphosate then enters the food chain. There is not a great deal of GM in Europe at present but imported grain and oil seeds have glyphosate residues. In Europe the use of glyphosate has been extended from killing weeds to drying off cereal crops before harvest. From the perspective of Umbria this seems strange but in northern Europe summers are much wetter and cereal crops often have a large amount of green material in them at harvest time. This makes harvesting difficult as the machines are designed to handle dry material. Obviously such applications are an effective route for glyphosate contamination of cereals. The third possible source of contamination that may be relevant to olive growers are the glyphosate residues in the soil. Not all the glyphosate is broken down by the bacteria and some is attached to the clay particles in a similar manner to other phosphate compounds. This can then be released and taken up by the crop. If the crop is not a GM version the growth will be affected and the glyphosate will enter the food chain. The debate on glyphosate is a classic example of the conflict between a market economy and sustainability. The market economy encourages makers to increase sales of the herbicide by searching for new uses,COMMA while a sustainable approach would restrict its use to applications where it is extremely difficult to find an alternative. A ban on glyphosate is becoming more and more likely. For the olive grower it will be an irritation as glyphosate kills stubborn perennial weeds and its use in limited quantities for this application is not a hazard to food quality. Here in Umbria we are surrounded by forests and the invasion of the olive groves with perennial plants from the forest environment is a constant problem. The four important ones are the spina bianca, so called because of its white flowers in early spring. In English it is called blackthorn because of its black fruit. It has an invasive root system and the thorn bushes sprout from the roots. If left unchecked it will take over the grove and even the small shoots are a hazard for the nets during harvest. Fortunately it can be controlled without herbicides. Mowing a couple of time each year will keep it down to manageable levels. If the grove has been abandoned for some years the stems will be too big for the normal mower and you will need a trinciatore (mulcher) to chop through the spina the first time. Wild roses and blackberries (also called brambles) thrive under frequent mowing. The mowing is a severe pruning and it seems to reinvigorate them. Control is important again due to their nuisance value at harvest when they snag the nets. Glyphosate is most effective if applied in mid-season. Early in spring there are still root reserves of starch and the plants will shoot again. Late in summer the plants have stopped growing and the herbicide is ineffective as it works through a disruption of the growth process. One only needs a very small amount as the individual plants are spot sprayed. When I restored a grove of 400 trees for my neighbour we used 20 litres of glyphosate the first year but now five years later we use about one litre. We will probably continue at this rate for some years until all the bank of seeds in the soil have germinated. After that we will probable spot spray every second year as there will be a few new plants brought in through seeds dropped by birds. The fourth perennial weed is Old Man's Beard. It gets its name from the white fluffy flowers in late summer. It is a nuisance but not as serious as the others as it has no thorns but it climbs through the trees and needs to be removed at pruning time. Controlling it is difficult with herbicides as one does not want to spray any herbicide on the olive trees. This rather benign picture of herbicide use is not true of all olive growing. In Puglia the trees are very tall and picking with beaters and ladders is only possible on the bottom third or half of the tree. The top part is out of reach and they let the olives fall on the ground. Many growers now clear all the vegetation under the trees using herbicides – mostly glyphosate. This is not spot spraying of a few perennial weeds but boom spraying all the grasses and clovers that form a natural meadow. The olives can be picked up off the bare ground using a sweeping machine. This technique has caused considerable controversy in the southern part of Puglia where the Xylella fastidiosa (Xf) is present. There is considerable debate about the cause of the dead trees. Tests show that only a small proportion of the dead trees are infected with Xf and the alternative view is that the constant use of herbicides has created a sterile soil which is having an adverse effect on the health of the trees. I have not been able to find any research on the effect of glyphosate residues on olive trees but if the situation is similar to other crops the glyphosate could be accumulating in the soil due to frequent applications and low biological activity in the soil. The two are linked. The control of weeds reduces the soil organic matter and that in turn reduces biological activity. It is the activity of soil bacteria that breaks down the glyphosate. Whether this is killing the trees has not yet been proved but it is quite possible as it has been found to kill or reduce the growth of other crop plants. The other concern is the possibility of glyphosate residues in the olive oil. Of course it is perfectly possible that both herbicides and Xf are having an impact. Glyphosate is a case study in the future of farming. It is an example of the constant conflict between the market which is trying to expand and sell more and more products and the people's concern with sustainability and human health. It is not just the pesticides used in agriculture but also antibiotics that fall into this area of conflict. The challenge is to use these valuable products sensibly and not turn them into failures or hazards by gross overuse. Yvonne Barton comments: In our area of Umbria there are several olive growers who spray herbicide all around their trees to keep down weeds (a cosmetic effect rather than practical I fear) and hence we risk a build-up of the type Brian describes in Puglia. What a pointless and destructive approach! It is time to think about your olive fly control programme for this season. We all remember the disastrous year of 2014 when the olive crop was devastated by olive fly throughout most of Italy. That was due to a strange combination of weather that was extremely favourable to the olive fly. The olive flies hatch out from their pupae during mid to late June. They are then on the wing and start to build to serious numbers during June and July. By the last week of July they are laying eggs on the green olives. Early control in April or May is therefore useless. The olive fly numbers in 2014 were unusually high because July that year was cool and wet. We had 140 mm of rain that year which is extraordinary as July on average is our driest month with an average of less than 10 mm. Some years we have recorded no rain at all in July. The rain came with cool weather whereas heat kills a lot of olive flies. August was not as wet but it stayed cool so it was not surprising that the olive flies multiplied and caused such severe damage. The olive fly can have three to five generations between August and harvest in October or November. The flies lay their eggs on the olive. They hatch into grubs which eat a large portion of the olive; however in 2014 it was mould that caused just as much damage as the grubs. The mould entered the olive through the breathing hole of the grub and turned the uneaten flesh of the olive brown and smelly. Those who crushed their badly infected olives found that the oil was inedible. The grubs then turn into pupae which fall to the ground and overwinter until the following year. The pupae are tough and resistant to cold but severe frost can reduce numbers. Some growers put lime on the soil after the 2014 severe infestation but the general opinion is that this does little to control the pupae. The automatic reaction to such a pest is to reach for a bottle of deadly insecticide. Fortunately, this is not very easy for the professional grower of olives, and for the small grower it is very difficult indeed. There are insecticides but they have to be applied very precisely to be effective. One needs to examine a sample of olives every two or three days for eggs and small grubs. If 10 to 15% are infected one needs to spray. If the grubs grow and penetrate further into the olive they are out of range of the insecticide. For the small grower and even the professional this is too much work. The European Union is banning Dimethoate,the most commonly used insecticide for olive fly control. Most professional growers use another method based on repelling the olive fly. The trees are sprayed with a copper spray similar to that used on vines or with Caolin (Kaolin). Kaolin is a clay. The copper-based compound or the clay coats the olives and makes it unattractive for the flies to lay eggs on them. The olive flies are on the wing by the end of June but they lay their eggs in July and August, so this is the critical time to apply the copper or Kaolin. It is not a job that can be done by the average small grower. You cannot take your backpack sprayer and dose the trees. To get a good coverage of the olives you need an expensive sprayer with an air blast to ensure that the droplets penetrate the foliage and cover each olive. Of course the copper or kaolin can be washed off by summer rain. Another application will then be needed. In fact three or more applications are common. There is one spraying option that can be used by the small grower. It is based on an “attract and kill” system. Spintor fly is the product used. It is not applied to the whole tree but each tree receives a measured dose. The flies are attracted to the chemical and then killed. There is a backpack sprayer with a battery operated measure that controls the dose for each tree. The story so far is all doom and gloom for the small grower. The insecticide Dimethoate is being banned and it is too difficult apply at the right time. The repellent sounds better but application of it requires expensive machinery. Fortunately traps provide a low-cost alternative for the small grower. There are two main types of traps. There is the measuring trap and the control trap. The measuring trap is a tent like structure with a sticky underside. In the centre there is a tube of pheromone which attracts the olive flies. As they circle the tube they are caught on the sticky underside of the tent. One then counts them every week to determine the severity of the infestation. When it reaches a certain level one puts out the control traps. The pheromone traps are much too expensive to use for control. In my case I put out two in the whole grove and carefully counted the olive flies each week. By the end of July I had a chart of the figures and tried to find out how many flies were too many. The local advisers could not give me any numbers to work with. In August we had a spell of really hot weather and the olive fly population crashed to a zero count on the sticky tent so I was not concerned. After that I read in The Mediterranean Garden a letter from a grower in Greece describing a home-made trap that he used. These are so simple and cheap that I put them out as a precaution every year and do not worry about the population count. After the disaster harvest of 2014 there were meetings of growers throughout Italy to talk about olive fly control. We had a meeting of 300 or more growers in the cooperative frantoio (olive press) at Cetona which was addressed by an entomologist from Pisa University. He explained that traps were the only practical means of control for the small grower without access to expensive machinery. The trap he recommended was the Eco-trap. I find that the bait for the traps is generally felt to be unbelievable. By this I mean that people find it extremely difficult to believe that the olive fly is attracted by ammonia. Ammonia is a constituent of smelling salts. Smelling salts are ammonia compounds that release ammonia gas. They were a great Victorian remedy for genteel ladies who had fainted from an attack of the vapours: ammonia is not a pleasant smell and the shock was supposed to revive them. I find that most people cannot accept that it is the favourite flavour of the olive fly and bait their traps with honey and other materials that would be something they would like themselves. The Eco-traps are baited with smelling salts. The ammonia evaporates and the trap is exhausted after 60 days. This means that the grove will need to have the traps replaced during the season as protection is needed for more than 60 days. The home-made traps are much more ingenious. One starts with a plastic bottle – a one and a half litre water bottle is ideal. I paint the bottles with yellow paint. The theory is that yellow attracts insects. Even if this is not true the paint protects the bottle against sunlight and means it will last for many years. I then drill two holes 6 mm in diameter near the top. In the bottle I put two or three large spoonfuls of soil. This is ordinary garden soil – nothing special. I put in about three spoonfuls of urea. Urea is a very common fertiliser used by cereal farmers and can be obtained from any farm supply shop. I then fill the bottle with water to about the two-thirds level. The easiest way to do this is to put the urea and the soil in a funnel and wash it in with the water. I have called the home-made trap the Ureaka trap. No, it is not a misspelling of Eureka but based on the active ingredient – urea. The Ureaka traps needs about a week to become effective. The bacteria in the soil break down the urea and release ammonia. They do this slowly so the trap is effective for at least four or five months and does not need replacing halfway through the season. It can be used again in following years by adding more water and urea. There is no need to add more soil. The bottle is attached to the tree with wire and then plastic string. If you look at the photograph carefully you will see the 6 mm hole where the flies enter. They stay in the trap and eventually drown. At the Cetona meeting a grower asked the visiting expert if the Ureaka traps were effective. The entomologist replied that they were “all right.” The farmer was not happy with this lukewarm response and asked for a more definitive opinion. The entomologist responded by saying they were just as good as the Eco trap and cost a small fraction of the price. I put out a trap for every two or three trees but one needs to accept the limitations of the traps if one is surrounded by groves where no control is undertaken. I have friends who put a “wall” of traps against the invading flies and then one trap for two or three trees in the rest of the grove. Traps will not give you total control but they should be effective in keeping the infestation level low and the damage insignificant. One needs to revisit the life cycle of the olive fly for the timing. The flies are on the wing in June so I put the traps out then, whereas other control measures are normally taken in late July when the flies begin to lay eggs on the olives. In 2014, the year of the great olive fly plague, I had a crop that was slightly below average. I had olive fly but it was only a low level of infection and I picked the olives early before the mould established itself in the olives so the quality of the oil was good. During a Mediterranean Garden Society visit to Puglia I spoke to an olive grower who told me about a traditional trap used against olive flies. It was baited with anchovies, which of course release ammonia when they rot. In Spain they are experimenting with controlling the olive fly using the sterile male technique. Huge numbers of sterile males are released to outnumber the fertile males and so reduce and perhaps eradicate the population of olive flies. It is a well-recognised technique and could be a cheap and effective means of control. Figures released by the Italian farmers' organisation Coldiretti show some interesting trends in the olive oil market over the last 25 years. The most spectacular increase has been Japan where sales have increased by 1400% The only other country that comes anywhere near this rate of increase is the UK where sales have jumped by 763%. One should not get too excited by these figures, however, as they demonstrate a very low base level of sales rather than huge increases. These big percentage increases amount to 107,000 additional tonnes of olive oil whereas the USA market has increased by “only” 250% yet this amounts to an extra 320,000 tonnes of olive oil sold while Spain's increase of 24% is 96,000 tonnes or almost as much as Japan and the UK put together. The catastrophic fall in the standard of living in Greece has reduced consumption by 26% and as it is a natural olive oil-consuming country that amounts to 54,000 tonnes which is more than the UK has expanded. On the production side there is now more olive oil being produced outside the Mediterranean Basin but it has yet to have a significant impact on world output. Australia for example has increased olive oil production from virtually zero 25 years ago to about 8,000 tonnes on average but it is a drop in the ocean compared to Italy's 600,000 tonnes and Spain's production of about double that. The new olive oil countries have shaken up the industry in spite of their tiny contribution to world production. In Australia the local olive growers have successfully lobbied the government to achieve a reform of the labelling laws to remove the ambiguities and misrepresentations that are still used internationally. Local growers in the USA and Australia have been testing imported oils on sale and have found that many do not meet the standards for Extravergine. Instead of trying to improve the enforcement of the standard, the big producing countries have branded the Americans and Australians as “unhelpful.” Here in Italy the Carabinieri have found more examples of olive oil fraud. Initially the government proposed to reduce the penalties for fraud but fortunately the farmer organisations seem to have successfully stopped that proposal. The European Union seems to be unaware of the image problems that olive oil is having in markets such as the USA and has proposed a relaxation of the labelling laws. Once again the farmers are protesting and so is the Italian Minister of Agriculture. The EU proposal is to relax the 18-month rule on Extravergine olive oil. After 18 months the oil may have changed so much that it should not be labelled as Extravergine. The EU is suggesting a “Best before” date instead but that would be determined by the manufacturer. The manufacturers' lobby seems to have been hard at work because they have persuaded the EU, in the draft law at least, to water down the indication of country of origin. So far these protests seem to have had little effect. Olive oil suffers from the fact that most of the big processors and marketers are international food companies and they see olive oil as a global commodity while olive growers want to develop the market is terms of the flavour characteristics of each country and region. The big producers, particularly Italy and Spain, must not rest on their laurels. Asia is a small but growing market. While Japan's figures are dramatic India is also consuming olive oil. Asian countries are not well informed on olive oil quality and have been used as a dumping ground for poor quality sansa or pomace oil. This is the olive oil extracted from the solid mill waste – the sansa – using powerful chemical solvents. Twenty-five years ago one found it on the bottom shelf of the supermarkets but I have not seen it on sale in Italy for more than a decade. It is no doubt still used by manufacturers who put products such as tuna in olive oil. Selling sansa oil to Asian countries may be good business in the short term but will do nothing to develop an appreciation of the qualities of olive oil. I was delighted some years ago to see that Taiwan had banned some sansa oil but unfortunately it was not due to the sansa oil itself but because the green colouring was not registered. Not only is this an additional level of deception (Sansa oil is never green in its natural state. All the natural colour has been destroyed during the processing) but exports resumed once the artificial colouring agent had been officially registered. To give the Taiwan government its due, it has successfully prosecuted a businessman for mixing olive oil with low-grade palm oil and selling it as Extravergine. He received a four-year sentence but the expectations seem to be that it will be reduced to a fine on appeal. In India the major olive oil brand is owned by Cargill, the world's largest commodities trader. Commodity trading is about making a quick trade not developing a market for the long term. The selling of sansa oil has been justified on the grounds that Indian food is so strongly flavoured that the flavour of a good Extravergine oil would be swamped by the spices. The argument sounds plausible enough except that Indians are curious about exotic cuisines and Italian cooking is high on their list of foreign cuisines to try. They are disappointed because of the poor quality of the olive oil. World trade and international markets may seem to be remote from small farms in Italy. While most of us produce olive oil for our own use we often have a small surplus to sell. Hopefully this may cover some of our costs but the prices paid by the frantoio are low. It is extremely difficult to make a profit from a small olive grove unless you have a considerable amount of free labour. Here in Umbria one can see the consequences – hundreds of thousands of abandoned olive trees. These abandoned groves are a constant source of the olive fly. The European Union makes funds available for regional development of agricultural products. Some years ago we had one of these development projects for the Alta Orvietana region. The managers of the project promoted our local olive oil throughout Italy. All the evidence shows that this is a futile strategy in such a well developed olive oil market. Certainly sales increased while the promotion was in place but the increase was reversed when other regions began to do similar promotions. The European Union should insist that promotions take place in emerging markets such as India, China or Japan where a more permanent increase in sales is likely. If this was done by regional group these new markets would begin to understand the range of flavours in Extravergine olive oil that they will never find in the sansa oil currently available. By March the pruning of the olive trees should be nearly finished. In January I visited our family in New Zealand and gave a pruning demonstration on a couple of their olive trees. Of course it was completely the wrong time of year to do the pruning as it was late summer in New Zealand but I only pruned a few trees as a demonstration. Winter is a much better time to prune as the olives are dormant but pruning them in summer makes it easier to demonstrate the fruiting wood and non-fruiting wood. One can actually see the olives on the tree. For the novice pruner, olive picking is a good time to observe where the olives are on the tree. You can see the vigorous vertical shoots with hardly an olive on them while the hanging shoots carry a heavy crop. You can also see how some of the hanging shoots on the inside are becoming exhausted and have fewer olives. Some of the large growers actually start pruning immediately after picking as they have so many trees to prune. It is better however to leave them until the New Year since they are then further into their dormant period. Doing a little bit of pruning while picking is definitely a bad idea as you really need to concentrate on one task. Our family in New Zealand have only a few dozen trees as their real interest is vines but some of the trees had not been pruned for years and they reminded me of the neglected olive trees we acquired when we purchased our farm 25 years ago. The Marlborough region of New Zealand has seen the almost total disappearance of olives over the last 25 years as vineyards have proved to be much more profitable. The olives that are left are in groups of ten or twenty where for some reason planting vines was not practical. The trees I was working on had had some rudimentary pruning at an early age but years of neglect meant that the centre of the vase was now full of thick growth. The trees were growing taller and taller to obtain light. They were also growing laterally for the same reason. In the meantime many of the leaves and branches in the centre of the tree had died due to a lack of light. The first thing to do was to clear the centres out. This allowed light into the tree and meant that the lateral shoots received light from the inside as well as from the outside. This has the effect of reducing the growth outwards to find more light. It was now possible to see more clearly the shape of the tree; unfortunately the original three or four main branches which formed the basic shape of the vase had been allowed to divide, with the result that many of the trees had seven or more main branches. I was reluctant to thin these back to the classic three or four in one season since it would have meant removing well over half the tree but I would certainly do this over a period of a couple of years. Mechanical picking with beaters has reduced the need for a strict control over the height of the trees. Nevertheless it is still worth keeping them from growing too tall since the beaters are easier to work if they are not fully extended. It is most important to pick without ladders as they slow down the picking and are the cause of most of the accidents in the grove. I cut back the tall-growing shoots on the trees to control the height but one needs to go through the whole trees to take out all vertical shoots, not just those at the top. Vertical shoots produce few or no olives. Almost all the energy of the tree goes into these verticals rather than into the horizontal shoots that produce the olives. This is where the out of season pruning is a useful demonstration. One can say in winter that the olives will grow on the laterals but actually seeing them on the laterals is a more effective demonstration. One of the most difficult things to learn is how much one should prune. The Italian saying is until a bird can fly through the tree. In Italy a more practical means is to look at the neighbouring trees. This gives you the confidence to prune quite hard – something that is essential for trees that have been abandoned for years. In New Zealand, or in the Marlborough regions at least, I did not find a single well-pruned tree to act as a reference point. If you are restoring old trees, clearing the centre and taking out the verticals is probably all you need to do but after some years your pruning will have shifted the balance in the trees towards more horizontal and downward-hanging shoots. This is where the fruit is formed. Over the years this fruiting wood will become tired and will need to be thinned. The weak and exhausted fruiting wood should be removed. I prune our trees every year but many people in central Italy prune every second year. It takes longer but not twice as long so for the commercial olive growers it is a saving. In the south, in Puglia, they prune less often and correspondingly much more drastically. I simply use hand secateurs and carry a folding saw in my pockets for the bigger branches. Unfortunately pruning involves ladder work although I did go to a demonstration by Dr Panelli from Spoleto Olive Research Centre where he used extension secateurs all the time. I was most impressed but could not get the hang of it myself. We now burn the prunings. For many years we chopped them with a trinciatore – a mulching machine - which worked very well. Now we use a conventional rotary mower to cut the grass in the grove as it can pass under the trees. The rotary mower cannot chop the prunings as the trinciatore did, so we burn them. Although in principle I would like to see the organic matter returned to the soil, in fact our grass and legume pasture returns so much that I do not think the prunings would make a significant difference. During the Mussolini era it was compulsory to burn olive prunings because it was believed that they spread disease. I do not think there is any strong evidence that they do. Chop or burn – whichever suits your land management plan. March is the time to think about fertiliser for your trees. The conventional olive mixture is NPK + B with a lower level of nitrogen than the usual NPK mixtures. The olive mixes also include boron which is most important for olives. Unlike in southern Spain where boron deficiencies are acute, most soils in Italy have some boron but the application of small amounts will improve the health of the trees. Make sure the mixture you buy has NPK+B on the bag. It is difficult to apply boron without buying the complete mixture yet the other elements may not be needed. Nitrogen should be applied only in small quantities, if at all. Nitrogen will stimulate the growth of the tree but not the fruiting. If you have a pasture under the trees with a good legume content the trees will receive all the nitrogen they need from the legumes. Potassium (K) is important for fruiting but its availability depends on the pH of the soil. If the soil is alkaline, then potassium deficiency is unlikely. Finally there is the phosphate. I apply this because it stimulates strong legume growth. This means there is a vigorous pasture under the trees. When this is cut and mulched it increases the organic matter in the soil and provides nitrogen for the trees in a slow-release form. I believe a healthy soil is fundamental for healthy trees. Some months ago I wrote about land management and advocated the use of pasture in the olive grove rather than ploughing or cultivation. I have had a considerable response to the piece. I wrote it from general principles and my own experience as a farmer but I have since caught up with some newly reported research from Tuscany which fleshes out some of my argument with figures. Nadia Vignozzi, Sergio Pellegrini and Stefania Simoncini write in the 8/14 October issue of L'informatore agrario about their trial that compared pasture with cultivation under olives. They make the same points about cultivation causing the mineralisation of organic matter and the poor soil structure that develops as cultivation is used year after year. The soil absorbs less rainfall, it caps over with heavy rain and compaction layers form below the depth to which the soil is cultivated. What is so interesting about the article is that it puts figures on these general comments and they even startled me in their stark differences. First, the comparison was between a spontaneous pasture (there was no attempt to improve its botanical composition and push it towards more legumes) and what they called a minimum cultivation programme of 3 to 4 cultivations to a depth of about 10 cm with tined implements (cultivators with tines or teeth). With the pasture the rainfall could infiltrate the soil at the rate of 35 mm per hour on average. There was a range between 25 mm and nearly 50 mm per hour. This is remarkable as rainfall is rated as abundant if it is above 5 mm per hour. Above 10 mm per hour it is really heavy. Rainfall at a rate of 25 mm an hour or more is cloudburst stuff and is extremely rare. 25 mm is more likely to be the rainfall for a day not an hour. Of course the rain can still run off if the soil profile is full. Soil is like a sponge. It takes in a great deal of water but finally fills up. However the pasture will still hold the soil so erosion is minimal. With the cultivated land the infiltration rate averaged slightly less than 5 mm per hour with a range of 8 mm to almost zero. One can see how run-off and erosion are such a common occurrences in cultivated groves. The pasture improves the organic matter of the soil and its ability to hold moisture at a tension that is available to olive trees. “Tension” is the term used to describe the tightness with which water is held in the soil. Plants are only able to extract some of the water from the soil. The remainder is held too tightly to be of any use to plants. Organic matter holds water at low tensions thus making it available to plants. The researchers’ measurements showed that 170 mm (again an average with variations above and below) were available from the soil profile under pasture and 150 mm with the cultivated grove. On the crucial question of output and quality of the oil they could not come to a conclusion except to confirm the results of earlier experiments which showed that pastures compete for moisture with young trees and that cultivation is a good idea for the first couple of years with a new grove. Even then one does not need to cultivate the whole grove as the root zone of young trees is only a few metres in diameter. The question of yield is extremely difficult to determine in olive experiments. As we all know, the yield of olive trees is extremely capricious and this makes it difficult to determine whether an increased yield is due to some treatment or merely to chance. Researchers must subject their results to rigorous statistical analysis if they are going to maintain their scientific credibility but for us growers a lower level of proof would be helpful. The other difficulty with the experiment is that they used the term “spontaneous plant cover” yet this can include a multitude of different pastures. I have advocated a pasture with a large legume content (clovers, vetches and medic). The legumes will restore the soil organic matter more rapidly and provide nitrogen for the trees. To obtain a good pasture you will need some phosphate fertiliser and you will need to cut the pasture at least twice a year to prevent the grasses shading out all the other species. An olive pest, Xylella fastidiosa (Xf), has recently been identified in the Puglia region of Italy but there is considerable confusion over its impact. Bloomberg Business News reported the infestation as a major cause of the low level of olive oil production in Italy in 2014. In fact this was caused by the olive fly which has been with us for as long as olives have been grown in Italy. The Xf outbreak is extremely serious in the long term but the immediate impact on olive oil production for the whole of Italy is slight. Thousands of hectares of infected trees sound a great deal but in the context of the millions of hectares of olives in Italy it is insignificant. The disease is extremely serious in the longer term because there are currently no known control measures. If it spreads throughout Italy it would be a disaster. The outbreak is in Puglia which is the most historic part of the Mediterranean for olive production. 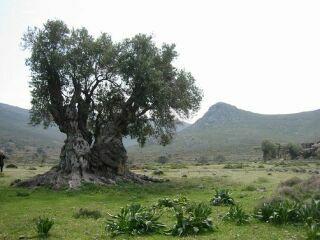 UNESCO has declared ancient olive trees a world heritage. Trees that are many hundreds of years old have been individually identified and recorded throughout the Mediterranean zone. Tens of thousands have been identified in Greece and other Mediterranean countries but Puglia alone has more than a million of these heritage trees. The disease is currently confined to the Salentino peninsular but all of Puglia and the rest of Italy is under threat. Xf is a bacterial disease that is transmitted from tree to tree by sap-sucking insects. The primary carrier of the bacteria in Puglia is the spittlebug (Philaenus spumarius). Infected trees die rapidly because the xylem (sap tubes) become blocked and the disease is sometimes called Olive Quick Decline Syndrome (OQDS). The Xf group of bacteria will infect a wide range of commercial crop plants including vines, citrus, stone fruits as well as olives but it appears that they are different strains of Xf. Xf has not attacked these crops in Italy. However the disease in Italy has appeared in other species besides olives, including almond and oleander. Most surprising is its appearance in oak trees. The appearance in oak trees is of great concern. There are millions of hectares of oak forest in Italy and if the disease becomes entrenched in these forests it will not only cause damage to the oaks but become a permanent reservoir of infection for the commercial tree crops. The outbreak was first identified in the Province of Lecce in 2013 and spread over many thousands of hectares. Controlling the advance of the disease with insecticides does not seem to be a practical method although it could have some short-term benefits. The main insecticide for use against the carrier insect is the neonicotinoid group which is being banned by the EU because of its adverse effect on bees. Of course olives are pollinated by wind not bees so the Italian government could probably obtain an exemption for a short period but other methods of control will need to be found. The Corpo Forestale is destroying infected trees but for this to be effective farmers need to obtain generous compensation so they will report outbreaks rapidly. Healthy trees need to be destroyed around the infected ones as a local buffer zone. The Corpo Forestale does not have the resources to monitor the vast area under olives in Puglia and needs to have the cooperation of farmers. They in turn must have a strong incentive to report their concerns immediately and not wait in the hope that the trees will recover. As well as generous compensation, the administration of the fund must be rapid. Thirty years ago the compensation for olive growers affected by severe frost in central Italy took years and years to be paid. The financial authorities must realise that the faster and better the payments, the less they will need to disburse in the long term. Short-term savings will translate into long-term costs. The EU has adopted a ban on the movement of plant material outside the infected zone and has protected that area with a further buffer zone and security zone. It can be seen from this map that the infected area (orange) is in the Salentino peninsula but there has been one outbreak already that has jumped the main buffer zone (dark green) into the Province of Brindisi. The security zone is purple. We were in the Salentino area during April 2015 on a tour organised by the Mediterranean Garden Society’s Italian Branch and saw many dead trees. I do not know whether they were infected with Xf but it is quite probable. We were certainly not aware of the various zones declared by the EU in February 2015. There were no signs on the roads or any other information indicating that we were entering the infected zone or buffer zone. In Australia we have had considerable experience of quarantine and have managed to keep Phylloxera (the disease of vines) out of South Australia through strict controls for more than one hundred years. These measures include large warning signs on all roads indicating that the movement of plant material is prohibited and on the major highways we have road blocks where trucks and cars are stopped at random and inspected. If the quarantine is going to be effective in Puglia the authorities will certainly have to take serious action to make people aware of the bans and enforce them. While the outbreak of Xf was confirmed in 2013 it is fairly obvious that it started some years earlier. It seems to have come in through the importing of ornamental plants from South America. Oleanders and ornamental coffee plants from Costa Rica are thought to be the main culprits. There have been other outbreaks in Europe. One was in Paris where an infected ornamental coffee plant was discovered in a suburban market. Paris is hardly an olive-producing zone but one should not laugh as London and Paris have large numbers of ornamental olive trees. It would be quite easy for a Parisian or Londoner to take their potted olive tree to their summer house in the south of France and spread the disease. Another outbreak has been discovered on Corsica which has about 7,000 hectares of olive groves. The Xf was found in a myrtle-leafed milkwort plant, not olives, but it could easily spread to olives and other trees. So far research has shown that this strain of Xf does not infect citrus but we are still waiting for more comprehensive tests on other plants. The EU is considering a ban on the importing of such plants. While this would be an excellent short-term measure it is time that the EU reconsidered its whole attitude to plant and animal quarantine. Many decades ago quarantine was used as an excuse for trade restrictions. The pendulum has now swung too far in the opposite direction and the free trade and globalisation advocates are in charge. Almost all quarantine has been swept away. It is time to rethink our policies and apply some more stringent needs-based tests. It is not enough to say that a particular plant may carry a certain disease. We should go further and ask whether the importing of a certain plant is really necessary. If it is not, then the assumption should be that it is not worth the risk. It may be a carrier of a disease not yet identified. In this particular instance Europe has plenty of oleander varieties. I cannot see any need to import more. Our standard of living will not be reduced if we cannot buy ornamental coffee plants. Merely testing the plants for disease is not enough. No one knew at the time that they carried Xf or that the strain of Xf they carried would infect olives. We have to assume there are other diseases out there that could be equally damaging. It is time that farmers and gardeners make their voices heard against the free traders and obtain some protection against exotic diseases and quickly. We do not need more reports, studies and reviews but implementation before another series of exotic diseases invades Europe. To think that olives have been grown in Puglia for well over 2000 years and may now be destroyed as a by-product of free trade is a terrible indictment of current trade and economic policy. At present the only method of control is the destruction of infected trees and those in the vicinity. There was however an interesting article in The Olive Oil Times in September 2015. It reported on research work being done at Texas A & M University on an Xf disease found in grape vines. The researchers made a mixture of four phages which they found significantly reduced the damage caused by Xf in grape vines. The ad infinitum may be a little exaggerated but the idea is sound. Most pests and diseases do have natural pests and diseases that control them in turn. We have found in Australia that new pests often arrive without their biological controls and we have to return to their country of origin to find their natural predators. The Xf that attacks vines does not appear to attack olives so other strains of phages will need to be found as well as effective means of introducing them into the infected olives. The researchers are only claiming a reduction in damage not a complete cure. All this will take some years so we will have to rely on the destruction of infected trees in the meantime. Hopefully this will be implemented rapidly. An alternative view is put forward on the website xylellareport.it. This group claims that the measures taken so far are too extreme. They say that only 1.8% of the trees tested so far have proved positive for Xf. It is not clear whether the 1.8% refers to trees already showing signs of decline or a sample of all the olive trees selected at random. The Xylella report group claims the major problem is that the olive trees have been treated with too many chemicals – herbicides in particular. Certainly when we were in Puglia with the Mediterranean Garden Society we noticed how the frequent use of herbicides under the trees had created an ecological desert with an adverse effect on the biology of the soil. There may be some validity in the report group’s argument that the problem has been exacerbated by a dependence on chemicals and poor soil health but the fact that 1.8% of the trees have tested positive can be used as an argument in support of the eradication policy. If the incidence is so low there is a good chance it will work. August and September will test your land management skills. During the last part of August or in September we usually have the heavy rain that marks the beginning of the growing season in the Mediterranean zone. This growing season has already started with some heavy falls that have caused flooding. These heavy rains can lead to a loss of water and soil from the olive grove. The loss of soil is the most visible effect and has the greatest long-term impact but the loss of water is also important. After a mostly dry summer (we recorded only 9 mm of rainfall between 20 June and 10 August) the olives need a drink. They are well able to stand this summer drought but need moisture in the two months leading to harvest in late October or early November. The great land management debate goes back to the previous spring and hinges on whether to cultivate the land or not. Traditionally olive groves and vineyards have been cultivated in the spring throughout the Mediterranean. The practice has some scientific support as the weeds that grow in the spring take moisture from the soil that would otherwise be available for the olives or vines. Of course some moisture will evaporate from the bare cultivated soil but the roots of weeds will penetrate to a considerable depth and take much more water. The opposing argument is that the cultivation of the soil year after year for decades and even centuries totally destroys the soil organic matter. Without organic matter clay soils have no structure. That means they pack down easily into something like the clay used for making ceramic pots. It is almost waterproof and the water runs off rather than soaking into the root zone. If the grove is on a slope the water will wash down hill taking some soil with it. In southern Spain there are large olive estates that have been cultivated for centuries and the olive trees are growing on small hillocks as much as a metre high. The roots of the olive trees have held the soil in the immediate vicinity of the trees but autumn and winter rains have washed enormous quantities of soil away between the trees. The erosion crisis is not confined to the olive estates of Spain but is happening here in central Italy although cereal farming is probably a greater culprit that the olive groves. The British School in Rome conducted an archaeological dig near Gubbio in the late 1980s. They found that the soil deposited from the erosion of the surrounding hills during the Roman period amounted to 20 cm. This period of about 400 years included moderately intensive cereal growing. After the collapse of the Roman state the population fell and cereal production was less intensive. There were more animals grazing on pasture and over the next 1500 years or so another 20 cm were deposited in the erosion sediments. From 1950 a whole new range of artefacts appeared in the sediments. The archaeologists referred jokingly to them as the Coca Cola layers. From 1950 to the late 1980s two metres were deposited or five times the amount for the previous 2000 years. I don't know whether there has been any further work on the site but I imagine there has been another metre deposited as the farming system has not changed. Gubbio is no exception unfortunately and I can see fields near Orvieto that will need to be abandoned soon as the erosion has been so severe that the bed rock is visible in places. I have found that cutting the grass, wild flowers and weeds in the spring over the last 25 years rather than cultivating has produced a soil structure in my olive grove that is like a sponge; even when all the grass is dry at the end of summer the heaviest rains soak in. In winter the sponge is eventually full and run off occurs but it is crystal clear and carries no soil with it. The arguments are not as simple as this, however – they rarely are in farming. Obviously the slope is important. In central Italy most olive groves are on a slope. Traditionally the valley floor has been used for cereals and in any case the floor is not sufficiently well drained for olives. The gentle slopes have been used for vines and the steeper and poorer ground for olives. The olives groves are therefore vulnerable to soil erosion. This is quite different from Puglia, for example, where the olives are grown on the plain or in areas with a gentle slope. The soil type is also important. Clay soils will cap over and become resistant to the penetration of rainfall more than loam soils or sand. Soil organic matter and the good soil structure that goes with a meadow are therefore more important. The jury is out on the moisture question. Cultivation will save moisture in the spring for the summer drought but the capacity of a soil with low organic matter to hold moisture is much less. In the autumn the situation is reversed with well-structured soils absorbing more rainfall than poorly-structured ones. 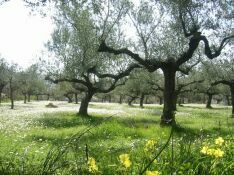 As well as the question of water, a well-managed meadow under the olive trees provides a healthy soil with more than enough nitrogen to satisfy the low requirements of the olives. The meadow will contain pasture legumes such as annual medicago, clover and vetch. When these are cut and mulched down in the spring they provide a fertile and healthy soil for the trees. There are other non-scientific reasons not to cultivate. Years of cultivation in the grove destroy not only the annual plants but also their seed bank. When the rains come in autumn the plant cover is limited to a few species that are prolific and early producers of seed that have therefore evaded the spring cultivation. Many of the colourful wild flowers disappear altogether, together with the bulbs and ground orchids. The grove has become an ecological desert. I cultivated my grove many years ago to level the ground. Before we purchased the grove it had been ploughed and many years later the ground was still uneven. I cross-cultivated to level out the furrows. Picking the olives that autumn was a battle against the mud. It was an experience I never want to repeat. If you are convinced that a meadow is the better option you need to act soon. If the land was cultivated in the spring is may be quite rough. If you decide to turn it into a meadow it is better to try and smooth it as much as possible because that is the way it will stay. In my olive grove the land had been ploughed in one direction and even ten years after the grove was abandoned the furrows still existed and I had to cross-cultivate to smooth them out. If the grove has been ploughed for years, little will germinate except some spiky thistles. Over a long period a meadow will emerge but seeding in the autumn with annual medicago, clovers and vetches will give the meadow a good start. Suffering from the summer heat? Think of the positive side. The olive flies are dying – well, like flies. Last year we had a disastrous harvest in Italy with Umbria and Tuscany being particularly hard hit. We were the only people to pick olives in our village and the frantoio (oil press) we use was open for only a few hours a day. 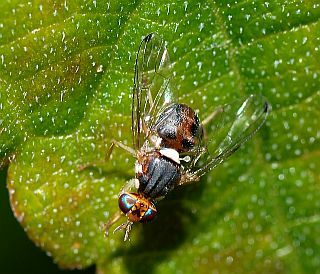 The major reason for the plague of olive flies was the cool and wet summer of 2014 although the mild winter in the previous year did not help. We recorded 143 mm of rain in July 2014. That was more than the previous November, yet November is usually the wettest month of the year. August last year was not so wet but it stayed cool and the olive flies thrived. This year we have had weeks of hot weather and not a single drop of rain for a month. It has decimated the fly population. Of course we could not anticipate such a sharp return to normal summers and I put out hundreds of traps for the flies in June. The recipe is in The Mediterranean Garden No 81, July 2015but I could have saved myself the bother as I think the heat would have killed most of them anyway. The traps have certainly collected many olive flies so they have provided me with peace of mind. While many plants in the garden are suffering from the heat and lack of rain the olive trees are fine. In California where they have had a severe drought for many years they are learning that olive trees do not require summer irrigation for a good crop of oil. Traditionally olives in California have been irrigated because the majority are used to produce olives for the table. Most of the olive oil comes from the olives that are rejected by the processors as too small for the table. The lack of water due to the drought has meant that the growers cannot irrigate and they have discovered the Italian tradition according to which irrigating olives for oil production needs to be carefully timed. If you have the water it is beneficial (in the years when rainfall is inadequate) during the period of flowering and then in September and October when most of the oil is produced. Irrigation during the summer will increase the size of the olives but they will have a low oil content and you have achieved nothing except higher processing charges at the frantoio (oil press). Earlier this year we went on the Italian Branch's tour of Puglia and were most surprised that so many olive trees were irrigated. The trees in Puglia are hundreds of years old and some even date back thousands of years. They have reached an enormous size without a single drop of extra water and we wondered why they needed it now. A telephone call to Corrado Rodio, owner of Masseria Brancati which we visited just outside Ostuni where the ancient olive groves include some trees that are between 2500 and 3000 years old, clarified some issues but not others. He irrigates all young trees to encourage growth. He also irrigates all trees if there is no water for more than a month whatever the season. In Puglia usually this is not necessary during the flowering period nor in September/October as there tends to be natural rainfall. While he knows that watering will increase the risk of olive fly (they like humidity and plumped up fruit) he maintains that watering does increase oil production. And so opens our debate about best practices and cultivation techniques in the olive grove. Most books written on olives in English describe pruning as a mystery buried deep in ancient folklore. There are exceptions such as Gucci and Cantini and our own book, but the majority have failed to understand the basic principles. Books in Italian (for example Del Fabro) are more practical and less mystical. A good pruner of olive trees can be compared to an artist where talent and technique are moulded together. The fact that a great artist may be a poor teacher of perspective should not disguise the fact that perspective is a technique that can be learnt. Similarly with olives. The techniques can be learned (the master pruner may not be the best teacher) and a reasonably competent job done. Most readers will have only a few trees or perhaps a small grove and will pick their olives by hand or use simple hand-held machines to speed up the task. In either case a good density of fruit on each branch is required for productive picking. An unpruned tree will have olives scattered in groups of one or two all over an untidy bush. Such trees are costly and frustrating to pick. Even if you are picking with your own labour and the unpaid help of friends, efficient picking is important. Slow work is most disheartening. A primary objective of pruning is to produce dense clusters that can be stripped off the tree in great showers. It is inevitable that ladders will be needed for mature trees but good pruning will prevent the trees becoming excessively tall and difficult to pick. In the early days of the New Zealand olive industry when pruning was rudimentary, one grower ended up employing the local fire brigade to pick his tall trees. There has been considerable scientific research conducted on every aspect of olive growing and oil production. One of the important facts to emerge is that the olive fruit requires strong sunlight at every stage from fruit set to oil production. Olive flowers that are in deep shade will not set in large numbers. Those that do will not produce good levels of oil. Pruning is therefore needed to reduce the density of the foliage and allow sunlight to penetrate into every part of the olive tree. Our pruning teacher from the University of Perugia suggested that every olive should be in direct sunlight for at least some part of the day. This objective is compatible with the need to produce trees that are convenient to pick. By reducing the density of the foliage one reduces the tendency of the tree to race up and out in a desperate search for more light. Olives are not the only tree crop to produce alternate heavy and light crops. Apples are as bad. The apple tree naturally produces a large crop of small apples one year and a small crop of large ones the next. The supermarket-driven demand for mediocrity in all things forces the apple grower to control the trees and produce a medium crop of medium apples. The mechanism is similar in olives. The tree produces a large amount of vegetative growth one year and has little energy left over to form fruiting buds. The crop is light and the following year there is a surplus of energy to produce an abundant crop. Pruning will help even out the poor and bumper years. My experience has been that our unpruned trees produced bumper crops or nothing. Not a single olive. Now we prune every year and the variation has been reduced considerably but on individual trees it can still be double one year compared to another. The major problem occurs when some climatic event such as a severe frost puts all the trees in the grove into the same phase. Our last bad frost was in 1995. Now most of our trees have broken free of the alternate cropping pattern imposed on them by frost damage. Last year a very poor crop in one part of our grove was compensated for by an excellent crop in another part. There are many different shapes for olive trees throughout the Mediterranean region. Tarek Amamou’s book shows some of the principal forms in Spain, Italy and North Africa but the differences are slight for the uninitiated and all the diverse shapes can be simplified down to two. The mono-conical and the poly-conical or to use less mathematical language – the Christmas tree and the vase or wine glass. The Christmas tree is a new idea that has no traditional basis in the Mediterranean. It was invented for mechanical picking using the shakers first developed in California. More recent scientific research conducted in Italy has shown that the Christmas tree shape is no better than the vase for mechanical picking. The theory was that the shorter distance between the main trunk and the fruit bearing branches would transmit a stronger shaking force. Actual experimental work has shown there is no difference in picking efficiency. The Christmas tree is more difficult to manage. Some growers in our comune are converting their Christmas trees to vases. The vase in various forms is by far the most popular shape throughout the Mediterranean and the most practical for hand or semi-mechanical picking. I would recommend it for growers with a few trees or a small grove. There is a third shape that is rarely found in the classic olive books (Vallerini is an exception) which is the recovered frosted tree. In central Italy and other cold regions of the Mediterranean all the growth of the olive tree is frosted off above ground at roughly thirty-year intervals. This is when a particularly severe Tramontana blows down from Siberia. Suckers shoot from below ground and three or four are selected as new trunks. They form a ring of new trunks around the stump of the old stem of the previous wineglass-shaped tree. If the tree is frosted again these multiple trunks die and again suckers are selected to form new stems. Each time a severe frost occurs the ring of multiple stems moves further and further out leaving a larger dead stump in the centre. Most small growers will purchase one or two year old trees to establish their grove. These are roughly a metre high, are sold in a small pot and cost about Euro 5 each. These trees will need to be shaped. It is possible to buy larger trees. Trees up to fifty years old are available from our local nursery but they cost over Euro 500. Even a few additional years of growth can be expensive. The price approximately doubles for each additional year and with each re-potting. These older trees are shaped. The pruning of young trees follows two contradictory principles that must be balanced. The first is to shape the tree into the form that, except for frost damage, will be its structure for life. The other is to allow the young tree to grow and build energy reserves. An old tree can be chopped and hacked with impunity and will rebound with enormous vigour from the energy reserves in the roots and trunk. The young tree will not. A determination to form the perfect shape by excessive pruning will weaken the young tree and stunt its growth for a number of years. Achieving the right balance is part of the realm of art and talent that distinguishes the good pruner from the also-ran. The shape of the olive tree is loosely referred to as a vase or wine glass but it is necessary to be more precise than this. It is actually one of those silly cocktail glasses that were common in Hollywood movies of the nineteen-thirties, when smart people drank Dry Martinis from little glasses containing rubber green olives on a stick. These glasses were open at an angle of ninety degrees. It is certainly not the shape of a Champagne flute. The whole point of the wine glass shape is to let in the light and allow the sun to shine on the fruit during the middle of the day from the inside through the hollow centre. A flute glass will not allow as much penetration of light into a mature tree as the wide-mouthed glass. The young tree purchased from the nursery has a central stem and a number of lateral branches. The objective is to select three or four of these laterals to grow up and out to form the structure of the glass. At a recent pruning refresher course run by our local comune there was much passionate debate about the merits of three and four arms which I cannot claim to be expert enough to understand. I have taken the soft option and allowed the tree to decide. If there are three good laterals I use them; if there are four I leave them. Occasionally there are only two. Then I need to find two more (a year or so later) on each of these for an eventual structure of four arms. There is also some debate about the height of the crown – that is the top of the stem in our cocktail glass simile. As far as I can see, except for the aesthetics of having a nice row of even trees it does not matter much between 80 and 120 cm. If you intend to use a shaker for harvesting the trees when they are mature 80 cm is too short and a minimum of 100 cm is needed. Having selected your three or four arms from upward growing laterals there is no need to cut the others off. You only need to ensure they are growing out and down – not up, as I will explain later. The arms that you have left will not grow into that perfect cocktail glass shape. Olive trees are never that obedient. More corrective action is needed. They will naturally shoot straight up into a flute glass shape. To push them out requires constant topping. The upward shoot is cut at a point where there is another growing up and out. The relentless upward growth is halted and replaced by another. The upward growth becomes a zigzag of up and out, up and out. As the trees start to crop the weight of the fruit will also bend the shoots outwards. Finally, you may need to take direct action. I was at first very scornful of bamboo birdcages but I have adopted them as a practical solution to recalcitrant trees that refuse to grow in anything like the right direction. It is a simple task in a small grove to tie on lengths of bamboo canes as spacers to push the arms into the right positions. If you have purchased a grove of mature trees your pruning task is completely different. If you are lucky you will have perfectly shaped trees that have been well cared for and you will only need to continue on the same track. It is more likely that the trees have been neglected and will need some remedial action. I recommend caution when it comes to reshaping the tree. Instead of the three or four arms growing out at a nice angle of forty-five degrees the original arms may have been allowed to split into two and then two again. Instead of three or four they rapidly turn into eight or more. Try to get them back by all means but not all at once or there will be nothing left of your tree. The other sign of neglect is excessive height. Here you will need to be more ruthless. Excessive height creates excessive shade and the lower parts of the tree will not produce fruit. You will be forced to use longer and longer ladders to pick the olives clustered round the top of the tree. The height must be reduced and the top shade removed to allow the bottom part to recover its productivity. After radical surgery with a chain saw you will need to understand routine or maintenance pruning. This starts with close observation of the tree at picking time. You can see that the fruit is borne on the hanging and lateral branches and not the verticals. You will also see that some of the hanging branches that bore fruit in earlier years have become exhausted and weak. From your observations at picking time your should be able to distinguish three types of growth on the olive tree. There are the strong vertical shoots that rarely produce a single olive. There are vigorous lateral shoots that are fruitful and there are the hanging shoots. The hanging shoots carry abundant fruit but a more careful examination shows that some are becoming tired and unproductive. Firstly do what I call a “clean up” of the tree. Take off all the suckers around base of the trunk and all the shoots that have sprouted from the main arms that are blocking the centre of the glass. Clean them off. Now you start the hard part where more skill and judgment is required. Your aim is to leave a single up and out shoot on the top of each of your main arms. That is three or four on the ideal trees or more in the neglected tree that you are trying to knock back into shape. All the other verticals should be removed. The problem is to distinguish the verticals. One needs judgment and experience. Some go straight up. That is clear and simple. Others go out at forty-five degrees. These are laterals that will bend down under the weight of olives and produce abundant crops. In between there are all sorts of angles that you will need to make a judgement about whether to remove or leave. Having removed the verticals which will be mostly around the top of the tree, you need to thin the hanging branches that have become weak. These will be towards the inside of the tree and it is often better to tackle them from inside the skirt of the tree. The growth of this fruiting wood is the mirror image of the upward growth. Whereas the upward growth was moderated into a zigzag path of out before up, the fruiting wood zigzags down. By cutting off the last zig or zag you will allow new lateral shoots above to replace the tired wood. Again judgement plays an important role. The dead wood on the inside is obviously pruned off. The vigorous laterals on the outside will produce abundant fruit. In between you must decide which should come off as weak and which are worth leaving for another season. Finally step back from the pruned tree and look at it as a whole to judge the overall density. The ideal tree should consist of three or four main arms coming from a trunk about 80 to 120 cm above the ground. Off these main arms are the lateral branches that bear the crop. At the bottom of the tree the laterals are old. They were produced by the young tree. They have grown out from the arms in a series is zigzags with the lowest and weakest hanging branches being cut off every year. They form the base of the cone (hence the name poly-conical) around each arm and combine to form a skirt around the whole tree. If the laterals are long and spindly they are chasing the light, indicating that you have not cleaned out the centre sufficiently for light to penetrate the inside, or the overall density of the foliage is too great. More severe pruning is needed to open up the tree. As you move up each main structural arm the younger laterals are shorter. They are unlikely to shade each other at this early stage but density is still important as they collectively shade the growth below. It is important to keep the upper parts of the tree open to allow the lower parts to remain productive, as they are so much easier to pick. Folklore says that you prune the olive tree until it is open enough for a bird to fly through it. Hiding in the olive grove and watching the birds is not a very practical means of judging the overall density of the foliage. Science tells you that you prune until you have a leaf area index of three or four. Leaf area index is the ratio of the area of the leaves on the tree compared to the area of ground covered by the tree. Counting the leaves would take even longer than studying the flight paths of the birds. Neither indicator provides an easy rule of thumb for the inexperienced pruner. My advice is to observe other trees in your district and to be sensitive to the symptoms of under-pruning. It is most unlikely you will have the nerve to over-prune so under-pruning is the usual fault of the beginner. Light and more light is the overwhelming principle of pruning. Letting the light into the tree improves fruit production. Letting in the light also keeps the tree under control. If the tree is dark and dense branches will race up and out to find more light. Amamou, Tarek, L’Olivier, (French) Edisud 1995. This is a small introduction of only 47 pages to olives in the Mediterranean. It is a useful reminder that of the long tradition of olive growing on the southern shore. Chatterton, Brian and Lynne, (English) Discovering oil – Tales from an olive grove in Umbria, Pulcini Press, Castel di Fiori, 1999. In spite of its title this is a practical guide to growing olives and the making and marketing of olive oil. Del Fabro, Adriano. (Italian) Coltivare l’olivo e utilizzarne i frutti. Demetra 1992 This short practical guide to olive growing is ideal for the small grower. Fontanazza, Giuseppe, (Italian) Olivicoltura intensiva meccanizzata, Edagricole 1998. This is essential reading for the serious commercial grower. Gucci, Ricardo & Cantini Claudio, (English) Pruning and Training systems for modern olive growing. CSIRO Publishing, Australia. 2000 An excellent guide to theory and practice including many experimental concepts. Photographs could be much better. Eretéo, Felix, (French) L’Olivier, Solar Nature 1988 Similar practical book to Del Fabro’s for French speakers. Vallerini, Lorenzo (ed.) (Italian) L’Olivo nel paersaggio agrario toscano Ponte alle grazie 1991 This is a classic for those interested in the olive from a historical and cultural viewpoint. It also has useful chapters on varieties and agronomy. Brian Chatterton has also written an E-book about olive cultivation. Chatterton, Brian Growing Olives and Producing Olive Oil. E-book, 2006. €15 + postage within Europe (request rates for other countries from the author). Distributed on CD by Pulcini Press, Castel di Fiori, 05010 Montegabbione (TR), Italy. The production of olive oil is a mystery. Unlike vines where teams of pickers or large machines bring in the vintage, the picking of olives is an inconspicuous operation. Pruning is the same. Vines are transformed from a tangled mass of twigs to neat pared rows of almost identical vines. One rarely sees the olive pruner at work. Perhaps there is a ladder propped against a tree and one sees some prunings on the ground before they are burnt or mulched. It would be a mistake to be fooled into believing that this is a nighttime operation carried out by elves. In fact the classic olive grove is the result of care and attention over many years. The olive trees in Umbria and Tuscany are not by any stretch of the imagination a natural landscape. The untended olive is an untidy bush and it is only through pruning that it has form. The Italian olive oil industry is an eclectic blend of the traditional and the modern. While the traditional techniques receive the greatest attention in marketing, the reality behind the scenes is often the most modern technology. Landcare in the olive grove has been slow to adopt more modern ideas. Most Italian olive groves are cultivated in the spring to kill the weeds and reserve the moisture for the tree. Over the years the fertility and structure of the soil is destroyed by this excessive cultivation. Heavy rainfall runs off and carries the soil with it. This problem has been reduced to a limited extent by terracing but the basic structure of the soil remains a disgrace. Some growers cultivate the soil in the autumn as well as the spring in a vain attempt to break open the soil and allow more rain to penetrate; I say "vain attempt" because cultivation can be effective for a few weeks but over the years the extra cultivation is even more destructive of the soil structure. Today many olive groves have been abandoned or at least are no longer cultivated in this destructive manner. More environmentally aware olive growers have allowed the grass to grow back and provide protection for the soil against erosion. The easy management option is to go through the grove with a mower or better a trincatore or mulcher in late spring and mulch down the grass and olive prunings. This will keep the grove tidy, reduce the fire risk and leave the ground reasonably clear for the autumn picking. If you have your own equipment for mowing or mulching you can mow the grass two or three times over the spring period. Keeping the grass down more frequently will encourage the growth of naturally occurring clovers, medics and vetches that are shaded out by the tall grass. These legumes fix nitrogen from the air and add fertility to the soil but are suppressed by grass. To encourage the legumes further, it is a good idea to apply some phosphate fertiliser during winter. The phosphate fertiliser and nitrogen produced by the pasture legumes will fertilise the olive trees. If your grove is still cultivated or has only been abandoned over the last five years, very little herbage of any type will grow. The cultivation over decades has not only destroyed the structure of the soil but also the reserves of seeds in the soil. In these circumstances you can speed up the recovery process by sowing some medic and clover seed. For those living in Italy, these seeds can be ordered from your local consorzio who in turn will need to contact a seed merchant in Sardinia who specialises in seed legume mixtures; readers elsewhere will find their own local suppliers. Summer is the period when little happens in the olive grove. I have many enquiries from Australia and New Zealand from growers wishing to claim tax relief on their European holidays by including a study session on an Italian olive grove in summer. I reply that this would be as interesting as watching paint dry and about as instructive. While summer is a period of little activity for the grower, the dreaded olive fly can be munching into your olives. The olive fly is a tiny midge that lays its eggs on the olive during the summer. The eggs hatch into grubs that burrow through the olive. The tell-tale sign is tiny air holes and of course if you break open the olive there is the little grub. The olive fly is a permanent problem at low altitudes as the eggs over-winter in these warmer zones. At higher altitudes the eggs are killed by the cold and the fly must re-infect each year. We have never had any olive fly damage in our grove which is at 550 metres. The grubs eat the olives and reduce the yield but they also allow mould to enter and this can give your oil a mouldy taste. The most popular form of control is traps. The difficulty is that the flies are spread from property to property and must therefore be controlled by the collective action of many growers. I would suggest that a small contribution to a group scheme is a cheap and effective means of control. The other great hazard of summer is hail and there is nothing one can do to avoid that. While hail is one of the many hazards of the long-suffering olive grower, the late summer thunderstorms are welcomed for their rain. The olive starts to produce oil in September and October in considerable qualities and the trees benefit from rain at this time. Picking in our zone begins in November when all the summer visitors have returned to their heated city apartments. The date for picking the olives varies from year to year but only by a few days. This is quite different from the grape harvest and is not determined by the same criteria. Traditionally, in our zone the olive harvest began on 25th November or St Catherine's Day. Olive growers in other parts of the world such as Australia who are without an olive-growing tradition find the idea of picking on a Saint's day a fascinating piece of folk farming that has no relevance in a modern scientific world. Scientific research does support the idea of a fixed day, if not precisely 25th November. The reasoning goes like this. The olives accumulate large amounts of oil in September and October. In November the rate of accumulation slows as the days become cooler and shorter. The olives begin to change colour but this is of no significance as green olives make the best oil with the most flavour. In December oil accumulation stops and the olives begin to fall to the ground. They fall slowly at first but the rate accelerates week by week until the losses are very substantial. The date you start is determined by when you will finish. This may sound rather strange but if the olives fall on the ground they are wasted. Not only is it unbelievably laborious to pick up fallen olives but they will ruin your oil as they have started to break down and have high acidity. No more oil is being produced in December and the oil you already have is falling on the ground. It is obvious that you should try to finish the harvest before there are too many olives lost on the ground. One works backwards. The last two weeks in November probably have the best combination of high oil and low fruit loss. Further back in the first half of November there is virtually no fruit loss but less oil will have accumulated in the fruit. During the 15 years we have been growing olives we have noticed that the harvest has become earlier. Growers are more interested in quality than quantity and the early picked olives have more flavour. We usually begin to pick our olives in the first or second week of November, that is, about two weeks before St Catherine's day. These are all dates for our zone. In your area picking could be some weeks earlier or even later. Friends who grow olives in the Chianti area, for example, pick their olives two weeks before we do. The same principle applies of a fixed date that only varies by a few days from year to year. When you are at the frantoio or oil press waiting for your olives to be pressed all the talk is about the oil percentage. Mine went 14%, what did you get? The old-timers will reminisce about the harvests in their youth when they got 20% and even more. They picked late – well into December and even January. Don't be fooled. They may have got high percentages of oil but they did not get any more oil as so many olives had fallen on the ground. If they picked them up the quality would have been very poor indeed. The reason for the late picking was the slow pressing. The frantoio could not handle the crop and the olives were left to wait in the loft over the frantoio – sometimes for weeks until they were mouldy. Given that choice, it was better to leave the olives on the tree until time was available at the frantoio. Oil percentages vary by as much as 5% from year to year. They are therefore useless as an indication of maturity. You can delay harvest until you have achieved a certain target oil percentage but you would be foolish to do so as many olives may have fallen on the ground. You will have a lower yield in spite of the higher oil percentage and the quality will also be poorer. We have now become such an urban society that old rural skills are forgotten and despised. It is thought that any fool can pick grapes or olives. Having picked many hundreds of tonnes of grapes myself over many years, I know that this is not true. I continue to marvel that amateur pickers can pick so few grapes and yet apparently look busy. No doubt our local contadini think the same about my olive picking. The most important thing is to have good olives to pick. Even a veteran Italian picker will pick very little on unpruned trees where the few olives are scattered all over the tree. One needs a net under the tree to catch the fruit. In the past they used many types of material but I recommend a proper olive-picking net made from knitted nylon that absorbs the energy of the olive when it drops and reduces the amount of bouncing and rolling. On a really steep slope you will still need to prop up the net. The nets come in all sizes. There is no point in dragging a huge net around small trees, but on the other hand the net must be big enough to catch all the olives. For mature trees a net of between 6 and 8 metres square is used and for young trees one of 4 metres square. The picking action is to pull your fingers down the twig and strip the olives off without the leaves. One can also use a small rake. Most small growers still pick by hand but machines are becoming more common. The only machine worth considering for the small grower with a few dozen trees is the electric one run from a car battery. I have no personal experience so I cannot recommend them. When the olives have been picked on to the net you roll them into a corner and pick out the twigs and leaves with olives attached. Do not worry too much about the other leaves as they will be removed by the vacuum at the frantoio. Where olives and leaves are still attached they will go through the cleaner into the press; as it is better not to have leaves in the oil, try to remove most of them at the picking stage. From the net they go into crates. The crates have mesh sides to allow air through. Good air circulation will reduce the chance of mould. Do not use solid-sided crates for this reason. In the past the olives went into trays and were then transferred to sacks for the journey to the frantoio but this involved pointless double handling. The olives were often squashed in the sacks. How much do olives yield? How long is a piece of string? The bottom of the scale is easy – nothing. Unfortunately that is quite common. Our best trees yield 40 kg each and have on rare occasions yielded more, even as much as 60 kg. 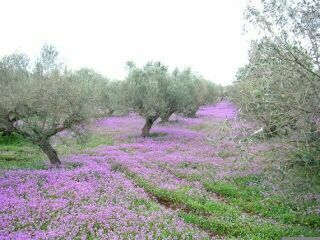 We have seen irrigated olive trees in Tunisia that yield 400 kg each. Over the whole of our grove we average 8 to 10 kg a tree. If the oil percentage is 14% this translates into a little more than one litre of oil per tree. Fifteen years ago when we first started to pick our olives all the local growers took their olives to the frantoio at the end of the harvest. Naturally we did the same. Since then we have come to realise that olives lose their flavour if they are stored for two to three weeks. The rule of thumb I learnt from an expert at the University of Perugia is that half the flavour is lost in a week and another half of what is left in another week. Given that we pick for a couple of weeks, that is more that we can afford to lose. We now try to take the olives to the frantoio every three or four days. That means they are on average stored for only two days. If we are picking good trees and are not interrupted by rain, snow or fog we can pick 80 kg of olives a day on good trees, or about 300 kg in four days. This is about the minimum amount our frantoio will take as a separate batch but the rule in each frantoio varies. You will need to balance the amount needed for a batch against the time it takes and whether you can work with a neighbour to form a bigger picking team. The olives are pressed at the frantoio; and most presses are now able to keep each batch separate so you take home your own oil and gloat over it. Quality is more important for the small grower than for the commercial one. For the commercial grower it is a question of costs and returns. For example, mechanical picking is carried out later than hand picking because the fruit are too difficult to detach by shaking. Late picking by machine may be cheap but the quality of the oil is lower. For the small producer the objective is to produce the best possible oil for your own use in sufficient quantity for yourself and some friends. The quality is determined overall by the variety of olive tree, the soil and the climate. The main ways of improving the flavour within these constraints is to prune well, to pick early and to take your olives to the frantoio every few days. Near Canakkale, 9 km from Troy and across the Dardanelles from Gallipoli, I run an olive grove of almost 6,000 trees on calcareous soils, which forms part of a 150 Ha organic farm. The trees are mostly elderly, dating from before the exchange of populations between Greece and Turkey in 1924, and have survived since then on a regime of neglect and picking-by-beating. From time to time some of them have been butchered in the name of rejuvenation (or ‘pruning’), and the general condition is poor. Yields are variable and currently average around 10kg per tree, which, if you know your olives, you will realise is pathetic (optimum yields should be approximately 45 kg per tree – more than four times what we are getting). The trees were last sprayed for olive fly in August 2004. 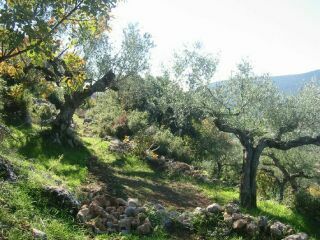 The decision to turn the land into an organic farm was taken in November 2004, and the trees are therefore ‘in conversion to organic’ until the end of the 2006 crop – after which they will be fully organic olives. The great threat to olive crops being the ubiquitous olive fly, the priority was to instigate a management programme which would deal with this minute but hugely threatening pest. For control of the olive fly we chose to use the Spanish olive fly trap. This consists of a clear plastic (PET) 1.5-litre bottle, into which holes of 5mm diameter are drilled around the top part (we use a soldering iron for this, with a metal template which fits around the top of the bottle as a guide – and to prevent soldering ones’ fingers). These holes are for the flies to come into the trap. The bottle is then filled with 1 litre of ammonium bicarbonate solution, the cap screwed back on, and each tree gets a trap. We hang them with a plastic-coated steel wire hooked around a convenient branch in the shade. The flies simply adore the delicious scent of the solution inside the bottles (it smells something like lavatory cleaner to us humans) and fly from miles around in search of the source. Once inside the bottle, they can’t find their way out again, because all of the attractant smells are inside (and they are quite busy drowning in the solution). As for results, this is a debatable issue. 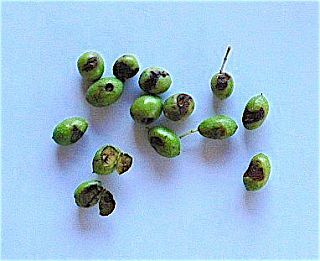 The olives picked in 2004 were riddled and pockmarked with olive fly damage – despite the fact that they had in fact been sprayed! The olives picked in 2005, after a season with fly traps, were 95% clean. I wonder if this was due to the success of the fly traps, or whether it was the absence of pesticide which enabled the population of olive fly predators (whatever creature eats olive flies) to multiply and hunt them down. The fact is that although our traps caught many olive flies they also trapped many other insects, some unidentified, but the overall numbers were smaller than we expected. If anyone is interested in studying this subject with us, he or she is most welcome. With the fly issue more or less under control, the next critical factor for olives is water. We don’t expect rain in Canakkale from April until November or December. The critical issue for our particular trees is that the last rain falls before the flowers can open, and the first rain in the autumn is usually after (or during) harvest. The local people tell us categorically that olives must not be watered. 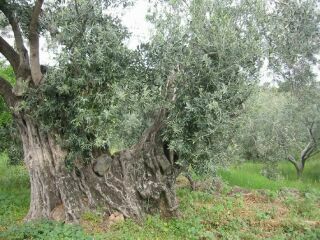 However, the truth is that though olive trees can survive drought, they do like a drink now and again (don’t we all…). So we water 6000 trees during May and June. It takes 6 weeks with 4 ladies working 6 days a week, and we give approximately 100 litres of water per tree, although larger trees get more. In other words, 600+ tons of water. The critical factor about watering in May is that if the trees are irrigated at the point of fruit-setting (between flower and fruit), it encourages them to ‘set’ a larger quantity of fruits per tree. In August, we repeat the whole process all over again. The August-September watering encourages swelling of the fruit. Once again, the timing is important: too early and the water is wasted; too late and the oil content is lowered. With so many trees, and such a long period thus required for each operation, some trees get watered too early and some rather late – but the overall effect is to increase the total tonnage of fruit, which is beneficial. During 2005 none of the trees were pruned – the weather was bad, and we were too busy doing other things… But in 2006 we have started a 5-year programme for pruning the trees. This year, only ‘escapees’ were cut – two or three branches per tree. These are the branches that are rising vertically upwards and out of the tree canopy. They are too high up and difficult to pick, and their removal allows more light penetration into the body of the tree. Four boys with chainsaws and hand tools cut and collected approximately 12,000 olive branches in 28 days, working flat out. The net result from this first phase of the programme is to bring down the overall height of the canopies, which will make picking that much easier. The second phase next year will be thinning the bunches of new growth, singling out a few strong leaders for the future. During the third year it will again be top-growth which will be reduced, and so on, until we achieve happy and contented, conveniently shaped and sized olive trees. Insaallah, as the locals say. As for climate, in Canakkale we are borderline for olive-growing. Once every 100 years or so, temperatures reach minus 12 degrees Celsius. Once every 50 years or so, statistically, temperatures reach minus 6, and temperatures of zero to minus 4 are expected routinely every two or three years. The winter of 2003 (before we started) was a 100-year statistic. 185 trees were killed during that winter on this particular plot, all in one field which is fairly flat and low-lying, and seems to have acted as a cold-sink. We cleared the stumps to plant apples and other fruit trees. The winter of 2004 was a 50-year statistic. Some trees lost the ends of their branches. The winter of 2005 was a 100-year statistic again (bring on global warming!) with a low one Friday night of minus 12 degrees. We didn’t lose a single tree – twelve 20-ton truck-loads of bark mulch, and any other mulching materials which could be found, had been spread around as many trees as possible, as a thick mulch. Perhaps it helped – who knows? Or perhaps the fact that we are not ploughing the ground, but rather trying to encourage a natural meadow around and among the trees, meant that the weed cover trapped sufficient snow to protect the trees from freezing. Another opportunity for a research project, perhaps? Previously, almost the only management technique applied to these trees was routine ploughing of the entire soil area. In my view, this was a diabolical approach – removing the vegetative ground cover, exposing the soil to wind and water erosion, increasing the evaporation of soil moisture content, depleting soil condition and resources, causing damage to the roots, and destroying the natural habitat for any creature which might otherwise have taken part in the local ecosystem. The stories in the village that there is treasure buried on this land (by the Greeks) may also have something to do with this practice! The new approach of maintaining the vegetative groundcover as a meadow system is radical indeed: no more digging for treasure, for one thing. The idea of mulching each and every tree with a 10cm thickness of wood chips is further evidence of our new-fangled madness – but add to that the hanging of plastic bottles in the trees, watering twice a year and harvesting by hand (no beating), and you begin to see how and why the villagers were convinced of my complete craziness. This year, however, I noticed that in one field on the other side of the valley the olive trees had been mulched with straw and compost – so the crazy ideas are being watched and copied, by at least one person. Harvesting is done entirely by hand. With 40 workers and everyone else who could be mustered it took two months in 2005. A lot of cajoling of the hired help, picnics in the fields, getting caught in the rainstorm: it all adds up to the fact that we had a lot of fun amid the hard physical labour. We plan to make the next harvest even more fun, and to invite as many people as possible to come and join in the experience for a few days each – having some ‘visitor’ pickers seems to encourage the hired help to work more efficiently! The management of all these issues ultimately leads to one overall objective, that of increasing the overall yield. If we can raise the average yield to 25 kg per tree within 3-5 years, this will be a success! At the same time, regular and careful management to reduce the biennial periodicity of fruiting will also benefit the project. In the future I also hope to find others who will join the team here and take an active part in the analysis of the efficacy of our efforts, in order to create effective guidelines for future programmes. The olive (Olea europaea L.) is one of the most characteristic tree crops of the Mediterranean basin. During the summer, like all other Mediterranean xerophytes, the olive is usually subjected to high solar radiation and high air temperature along with high vapor pressure deficits and limited availability of water. The olive is a sclerophyllous evergreen tree with a high degree of drought tolerance, suitable to areas where little water is available. The olive’s ability to acclimatize to water scarcity includes alterations at the leaf level, associated with biochemical changes, morphological adaptation and physiological changes. Olive trees can grow also in nutrient-poor but well-drained soils. The trees need full sunlight during summer and a slight degree of chill during the winter for flower bud differentiation and fruit set. Olive trees should not be cultivated in areas where the temperature often falls below -5 oC, as they do not tolerate very low temperatures and get severely damaged by winter or early spring frosts. Olive trees may also be damaged by hot and dry winds, especially during the period of flowering and fruit set. Heavy rains during this period also deplete pollen from the flowers and result in low fruit set. The planting scheme for olive trees depends mainly on the cultivation system that will be applied to the orchard (either intensive or non-intensive). For intensive cultivation fertile soils and sufficient irrigation or rainfall are required, while these are not a prerequisite for non-intensive cultivation systems. Olive trees have been planted for years at intervals of approximately 10 m x 10 m or even more. This planting distance leads to a limited number of trees per hectare (approx. 100 trees/ha). In areas which are characterized by a long period of drought such spacing enables each tree to exploit all the available water (photo 1). However, in areas where the climate is not so dry and the soil retains water these planting distances are now considered too high. Dense olive planting, where the trees are planted densely at 5 x 6 m or 6 x 6m. For the past decade a new planting system is being tested in olive cultivation. It is called the high-density orchard system and it uses almost 1500-1800 trees per hectare (photo 2). The main objective of this system is to reduce the cost of harvesting, which in traditional olive cultivation amounts to about 40-50% of the total cost of producing olives. Olive trees require potassium, magnesium, nitrogen and boron. Nitrogen is the element most essential for both vegetative growth and the production of flowering and fruit set. It may indirectly affect the alternate bearing phenomenon of olive trees. Olives respond readily to nitrogen application when they are grown in low fertility soils and when soil moisture is not a restrictive factor. Depending on soil fertility and moisture, an average application of 500-1500 g of nitrogen per tree is usually recommended for a bearing tree (1kg N= approximately 5kg ammonium sulfate, 3kg ammonium nitrate, 4kg calcium nitrate or 2kg urea). The timing of the nitrogen application should be related to the availability of water, whether rainfall or applied by an irrigation system. Most fertilizers containing nitrogen should be spread on the soil a few hours before rainfall or irrigation, so that there is minimal or zero loss due to evaporation of the nitrogen in the form of ammonia. The season of nitrogen application is strongly related to flower induction and fruit set. Most of the quantity to be given (2/3) is usually applied at the end of winter, before flower bud differentiation and before the growth of new lateral shoots. The rest is applied during the flowering period (from the pre-flowering stage till fruit set). At this time one can apply nitrogen either directly to the soil (pre-flowering period) or through foliar application (mainly with urea, pre-flowering and fruit set). In this way the fruit set is significantly increased. The effectiveness of the nitrogen fertilization programme can be assessed by checking the length of the new growth, which should be sufficient when the appropriate amount of nitrogen has been applied. Phosphorus deficiencies are not so common in olive culture. Phosphorus is usually applied every two to three years. The application of phosphorus should be followed by its incorporation into the soil, so that the mineral element can gradually reach the root zone (phosphorus is highly immobile in the soil). It is considered necessary to give phosphorus when soils are acid or characterized by high amounts of calcium carbonate. Potassium is one of the main nutrients needed by the olive. Large amounts of potassium are removed from the soil when the fruit is harvested and by pruning, particularly in high-yield seasons. Regular potassium fertilization is necessary to maximize both yield and quality. Potassium is usually applied during the winter (after incorporation) in order gradually to reach the rooting zone by the action of rain. In areas where the availability of water does not pose a problem, potassium can be applied at the end of winter. The fruit of the olive is highly demanding as it grows, which means that an additional amount of potassium should be applied in the years of heavy yield during the period of fruit growth, in other words in the middle of the summer. This application is better given in the form of a foliar fertilizer, in order for potassium to be readily absorbed and translocated to the parts (sink) of the tree that need it. Boron is also another major element required for olive culture. Boron application as a foliar fertilizer usually gives better results when applied during the pre-flowering stages. Thus the trees are sufficiently supplied with boron, which plays a major role in pollen growth and thus fruit set. Most growers combine a foliar fertilizer of boron with urea and some times seaweed extracts during this period, in order to achieve the highest fruit yields. Magnesium is also another major element needed by olives. It is a major constituent of the chlorophyll molecule. This means that it plays a significant role in photosynthesis. Magnesium is usually given only after a deficiency has been detected. Nevertheless, most fertilizers contain a significant amount of magnesium, so that it is applied in sufficient quantities along with the other major elements (nitrogen-phosphorus-potassium: a full strength fertilizer of the type 21-21-21-2 w/w means that it contains 21% of nitrogen, phosphorus and potassium and 2% w/w of magnesium). The best way to evaluate the nutrition status of the olive tree – as of any plant – is to carry out a soil analysis along with a plant tissue analysis (usually leaves are used). These analyses will give significant data on the status of both soil and plant, indicating the appropriate fertilization programme to be applied. The aim of this type of pruning is to develop a tree shape during the first years after planting that will facilitate all cultural practices (spraying, soil cultivation, irrigation, harvesting etc) and will enable the tree to best exploit the sunlight and rainfall occurring in the area of cultivation. The most common shape for the olive tree is the “cup-shaped” tree or “free-cup”. To form this shape the newly planted one-year old trees are cut back to a height of approximately 60-80 cm above soil level. The main aim of such a practice is to force 2-4 side branches to develop around the axis of the tree, at a distance of 30-40cm from each other and at a height of approximately 40 (the first) to 80 cm from the ground. These branches should in future comprise the main branches (primary limbs) of the tree. On these branches new side shoots will be encouraged by cutting the old branches to a length of approximately 50cm, thus removing the so-called shoot tip dominance and making the lower buds sprout. 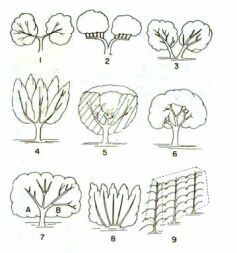 There are also many other tree shapes that are used around the world, some of which are shown below. The two-branch shape, which is common in Andalucia, Spain, for table olive varieties. The candlestick shape used in Tunisia. The double or triple trunk shape used in Seville. The multi-conical shape, in which every branch has the shape of a cone, found in some regions in Italy. The spherical cup shape seen in France, Italy and Greece. The spherical shape, which is not so common because it does not give ample light to the whole tree. The non-trunk shape seen in Tunisia. The free palmate. This shape presents some difficulties and is not widely used, at least for olive oil producing varieties. Olive trees produce fruit on the previous year’s branches. This means that in order for us to have fruit every year we must ensure adequate vegetative growth every year. Very vigorous shoots are not productive, as they are mostly full of vegetative buds. The aim of pruning is thus to induce branches that will bear fruit by exposing them to the light and maintaining a vigorous and active fruiting zone. The olive tree produces fruit mainly at the periphery and top of the canopy. This is because these parts of the tree are fully exposed to sunlight and become fertile. Based on this fact and on the aims analysed above, pruning for fruiting should consist of the removal of any part that shades other younger parts of the tree (photo 5). In this photo we can see that the branch which now has fruit on it will be cut down during the following year in order for the upper branch to bear fruit (due to the favourable lighting conditions), which would eventually lie over the older branch and shade it, thus making it non-fruiting. In this way the branch is not led away from the central axis of the tree, as can be seen in photo 6. When a thick branch is to be cut off we must take great care to avoid tearing the bark of the remaining branch. This is usually done by making a total of three cuts, as it is clearly shown in Figure 1. The first cut is made from the lower side of the branch to the middle of it, some centimetres away from the point where we want to cut the branch. The second cut is made a few centimetres away from the first cut and usually before the completion of this cut; due to the weight of the branch, it will fall, tearing the bark of the remaining branch to the point where the first cut was made. We can then easily cut off the small remaining part, to the point desired. 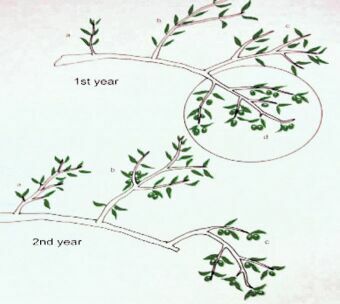 Scheme of the pruning of fruiting branches over a two-year period. The main characteristic of the olive tree is its longevity, resulting from its ability to produce new shoots from nearly every part of the wood, thus making it possible to renovate senescent trees or those that have been damaged by frost or fire. This type of pruning is consists of cutting the tree at the main branches or even at its trunk. The most significant practice, however, is to return during the next months and remove by hand (when they are still young) the shoots that will be of no use to us. We should not wait until the following year to give the tree the shape we desire (pruning for shaping the tree), as we would very likely have wasted almost an entire year before the beginning of fruit production. The new tree enters its fruiting period after 3-5 years, depending on the cultural practices used. After any pruning or cutting it is advisable to cover the wounds with wound-sealing pastes and to spray the trees with a copper-based fungicide, in order to prevent the tree from developing bacterial or fungal infections. The pruning of olive trees can be done during the period between autumn and winter. It is generally performed after the harvest, but we should wait until the period of heavy rains and frost has passed in order to prevent infections. We should never prune on a rainy day, as this will probably spread bacteria to the cut surfaces or to internal wounds invisible to the naked eye, resulting in bacterial canker of the living tree (for those varieties susceptible to bacterial canker). Irrigation and weed control of olives grown in gardens is usually a simple practice and there is nothing special to be noted. Nevertheless, we should know that the critical phases for water stress in the olive tree are principally the periods before and after flowering (during fruit set), when drought can result in a significant reduction in the flowering and thus the fruit set, leading to low production. All content (c) copyrighted by source or author, not to be reproduced without authorization.